Around 80 people attended a politically charged Save Our NHS Leicestershire public meeting on 6 April to discuss the planned reorganisation of Leicester's hospitals. Speaking at the meeting was Sally Ruane, a local health policy academic and NHS campaigner, and Mark Wightman, the Director of Communications and Strategy for the local NHS Trust. But the speakers were not the main attraction. For about an hour, the audience bombarded the Trust's representative with story after emotional story about the devastating effects of NHS cuts and the woeful level of care in the community. 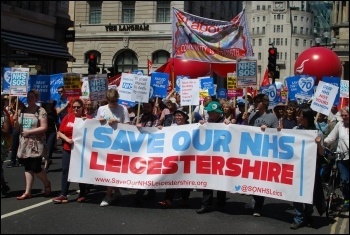 Save Our NHS Leicestershire is concerned that the Trust's plans do not include an increase in the number of beds, even though local hospitals currently face a crisis because of lack of capacity. Only recently, the Leicester Mercury carried a front-page article about a 94-year-old Leicester resident who was shoved from hospital to home, and back to hospital again 13 times in the last ten weeks of his life, apparently in an effort to free up beds in acute hospitals. The audience was clear: the crisis in the NHS has already put an unbearable strain on families. The Trust's spokesperson was slick. But in summing up he was forced to admit that the biggest risk in the Trust's plan was that community services would not be able to make up for a standstill in the number of beds. Save Our NHS Leicestershire is fighting for an NHS that is fit for purpose. We are campaigning to expose the inadequacies of the local Trust's plans and to build a movement capable of forcing more money from this weak government. 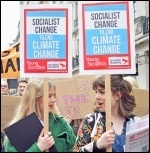 Socialist Party members, who are a part of the campaign, call for all cuts and privatisation in the health service to be reversed. We demand a fully funded, socialist NHS, run democratically by workers and service users. 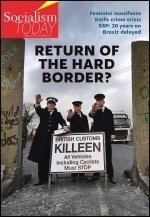 Giant pharmaceutical companies and big corporations in the supply chain should also be nationalised, under democratic workers' control, in order to prevent the NHS being bled to death by big business.